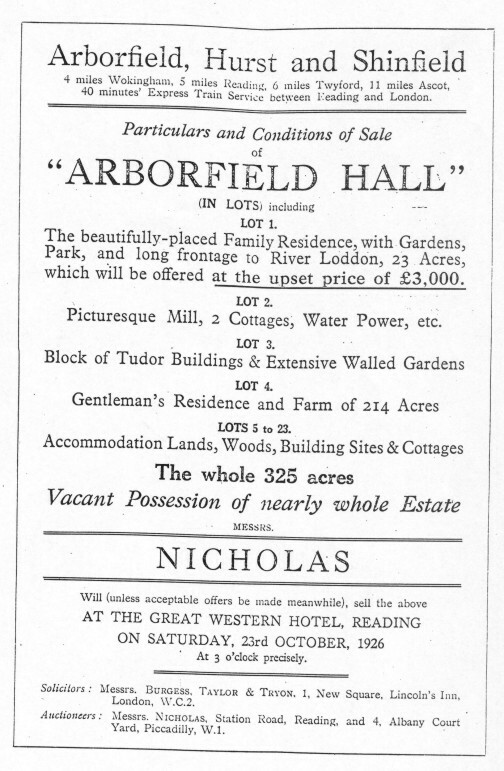 The Auction Sale document of the Arborfield Hall Estate dating from 23rd October 1926 was held in Reading; it was sold in several Lots, the main purchasers being Guthrie Allsebrook (the Hall and its surroundings) and the Holdstock family (Hall Farm). Along the Reading Road, there were seven lots (nos. 8 to 14) intended to be sites for development as housing plots. Had these been sold to individual purchasers, Arborfield would have been subjected to 'ribbon development' similar to what happened in Winnersh, and each plot might by now have been sub-divided into small estates. Luckily, they were all bought by the Holdstocks. After WWII, the entire site was bought by Reading University.